The third Parliament which opened in April 1956 elected H.S. Ismail, the Independent candidate who won the Puttalam seat without a contest, as the Speaker of the House of Representatives, also uncontested. While the Speaker presided over the parliamentary sessions, the administrative duties were the responsibility of the Clerk of Parliament, later changed to Secretary-General with the 1972 Republican Constitution. 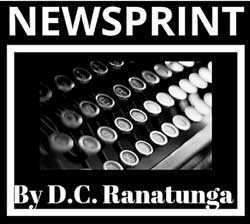 The Clerk was R. St. L.P. Deraniyagala who had a long stint from inception of the parliamentary system in 1947 until 1964. He was succeeded by Sam Wijesinghe. The presiding officer of the Senate was the President who was appointed by the Governor-General, on behalf of the Queen of England who was the Head of State, from among the members. Sir Nicholas Attygalle was the President at the time I started reporting Senate proceedings. He was earlier Vice-Chancellor of the University of Ceylon having defeated Professor G.P. Malalasekera. The Clerk of Senate in charge of administration was Vernon Samarawickrema. Legislation passed by the House of Representatives was sent to the Senate for further discussion. Once approved by the Senate, the Bills were submitted to the Governor-General for his signature. In addition to the Sinhala Only Act, the Bandaranaike Government passed several other significant pieces of legislation. The debates were most interesting and covering them was a pleasure. A Bill to privatise the bus services hitherto held by private owners/companies was passed in Parliament on 16 September 1956. The Act was effective from 1 January 1958. It was in 1907 that buses were first imported to Ceylon, a British colony, and bus transport began as an owner-operated service. Until the mid-1930s it was a ‘free for all’ policy when there were no restrictions as regards the specific routes owners should use. At least three surveys done after Ceylon became independent (in 1948, 1954 and 1956) recommended that the companies must be nationalised. It fell on the Minister of Transport and Works Maitripala Senanayake to implement the recommendations, and establish the Ceylon Transport Board (CTC – now SLTB). Vere de Mel, who had successfully launched the first taxi service with a fleet of vehicles (Quickshaws) in Sri Lanka, was appointed Chairman of CTB with several senior public officials in key management positions. 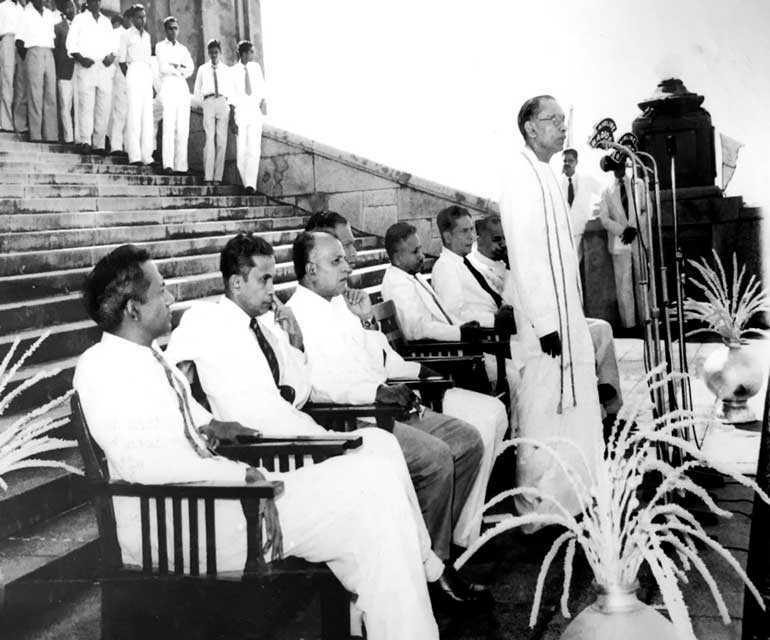 To mark the occasion, a simple ceremony was held on the steps of Parliament when Prime Minister Bandaranaike addressed the people who gathered. Thereafter along with Minister Senanayake and other invitees, the Prime Minister boarded the first CTB bus and did a round. At a time when free movement was possible the journalists were allowed to stand on the steps and watch the proceedings. I was there to report the first event of the Government’s nationalisation program. Education Minister W. Dahanayake’s proposal to upgrade the oldest Pirivenas to university status was hailed as another step to promote national languages and culture, and uplifting of Buddhist education. With the passing of the Vidyodaya University and Vidyalankara University Act No. 45 of 1958, the two pirivenas achieved university status. The Vidyodaya Pirivena in Maligakanda was established in 1873 by the illustrious alumnus of the Ven. Hikkaduwe Sri Sumangala (1827-1911), an illustrious alumnus of the Paramadhamma Cheiya Pirivena in Ratmalana. With the raising of the status the Pirivena principal, Ven. Welivitiye Sorata became the first vice-chancellor. The university was ceremonially opened by Governor-General Sir Oliver Goonetilleke in his capacity as ex-officio Chancellor on 16 February 1959. The Vidyalankara Pirivena was established in Kelaniya on 1 November 1875 by Ven. Ratmalane Dhammaloka (1828-87). Ven. Kirivaththuduwe Pannasara who was principal of the Pirivena became the vice-chancellor. I covered the inauguration of the university on 17 June 1959 by the President of India, Dr. Rajendra Prasad. The Paddy Lands Act passed in 1958 ensured the security and equitable terms to tenant farmers who used to farm the paddy lands in exchange for a share of the produce. The landmark legislation was presented by the Marxist Minister of Agriculture, Food and Cooperatives Philip Gunawardena.